Three factors impacting air freight in 2018 - Specialty Freight Services Inc.
Technology, laws, and current events move ever forward. The air freight industry is a key player in global trade, and in 2017 air freight demand grew by 9% in the strongest year since 2010. Here are three of the biggest factors impacting air freight this year. The pilot program for ACAS was implemented in 2010 following a security issue. In June 2018, the U.S. Customs and Border Protection (CBP) finally and permanently implemented ACAS for all planes. The ACAS requires shippers to provide advance cargo data on each shipment of air freight aboard U.S.-bound planes. This enables the CBP to calculate a risk assessment for each flight. Because each cargo load from each shipping location carry different risks, this allows the CBP to decide before the flight gets in the air if it represents a likely threat. The CBP will be able to screen flights and issue do-not-load instructions to cargo flights that it deems necessary. Both carriers and forwarders have been receptive to this additional security level. If working correctly, the ACAS program works efficiently and requires minimal physical screening to provide its security layer. This means that most cargo flights are unaffected. However, as with all changes in policy, there might be growing pains as the scale ramps up and the program is enacted as mandatory. In June 2018, U.S. President Trump enacted a 25% tariff on $50 billion in Chinese goods, and in July the Trump administration announced a list of 10% tariffs on $200 billion in Chinese goods. President Trump has also threatened a 20% tariff on imported automobiles. While air freight is not specifically a key player in what could be an escalating trade war, its core status in global trade will tie it to the results of such a war. International Air Transport Association CEO Alexandre de Juniac asserted in mid-July that trade wars “only produce losers.” If a full-throated trade war does occur, it will undeniably impact the air freight industry. While the implementation of delivery drones that personally deliver your Amazon package to your front door has progressed very slowly, autonomously operated aircraft are certainly a possibility in the air freight industry, just as autonomous driving vehicles are a factor in the ground shipping industry. The potential for sharp implementation of drones in an industry ripe for innovation is immense. And though we likely won’t see drone deliveries take off in 2018, we could definitely see significant groundwork for the channel. 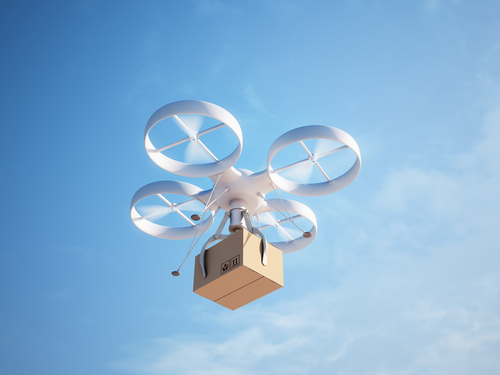 Keep an eye out for any new bills by Congress that specify drones’ legal status, as well as steps that air freight companies take to prepare for a looming pilot shortage as well.